Mira’s parents have tried everything they can think of to fix her crippling anxiety, and, as a last resort, send her to a private school. Her best friend, Sebby, goes to public school, and Mira is doubtful that the switch will help her. Then they meet Jeremy, a boy struggling with his own issues, just like them. 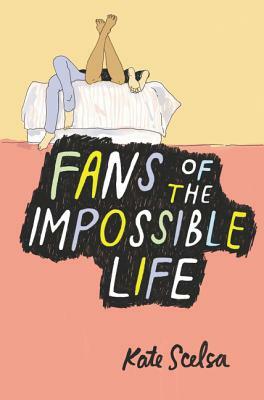 This unlikely trio of oddballs bands together to deal with anxiety, sexuality, and drugs all while being somewhat “normal.” Kate Scelsa’s Fans of the Impossible Life reminds us that it’s okay to fall apart as long as you have the support to put yourself back together. A captivating and profound debut novel about complicated love and the friendships that have the power to transform you forever, perfect for fans of Nina LaCour and of The Perks of Being a Wallflower. Jeremy is the painfully shy art nerd at Saint Francis who’s been in self-imposed isolation after an incident that ruined his last year of school. When he sees Sebby for the first time across the school lawn it’s as if he’s been expecting this blond, lanky boy with a mischief glinting in his eye. Sebby, Mira’s gay best friend, is a boy who seems to carry sunlight around with him . Even as life in his foster home starts to take its toll, Sebby and Mira together craft a world of magic rituals and impromptu road trips, designed to fix the broken parts of their lives.